Of all meteorological phenomena, from puffy white clouds to dramatic lighting strikes, probably the most universally loved is the rainbow. And really, what’s not to love? Coming as it does on rainy days, the rainbow can be seen to represent a promise of better times after adversity or hardship. The many beautiful shades of a rainbow have also come to stand for the wonders of human diversity. 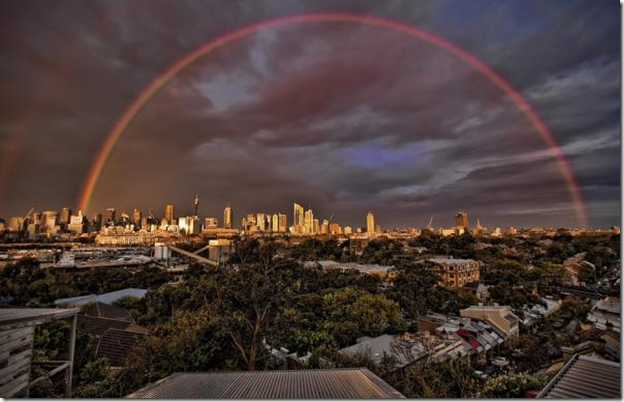 The rainbows in these pictures are certainly diverse, standing as they do over some of the greatest cities in the world - from Sydney (top image) to Istanbul. So let’s take a look at a few more metropolises, framed by one of nature’s most beautiful creations.